overview of our projects realized during the last thirty years. Best Comfort Hotel outside of America: This is the award that has been awarded to Friedrichshafen. At the international convention of Choice Hotels in Las Vegas the hotel prevailed against the global competition of the brand. 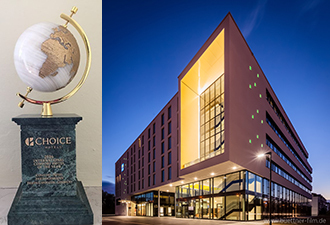 The title «International Comfort Hotel of the Year» is being awarded every two years by Choice Hotels, one of the world’s largest hotel chains. The H+G EQUIPMENTS GmbH HOTEL + GASTRONOMIE EINRICHTUNG / AUSSTATTUNG is a purchasing company for completely equipping hotels.